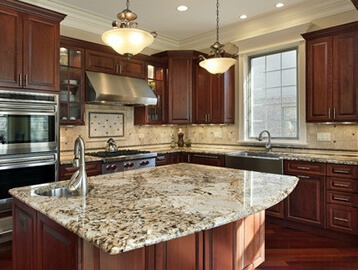 Granite is an attractive natural stone that will add color and warmth to your kitchen. It’s an extremely hard material that will not blister, scratch or crack. It is available in hundreds of colors, from various shades of white to browns, reds, greens, blues, and black. 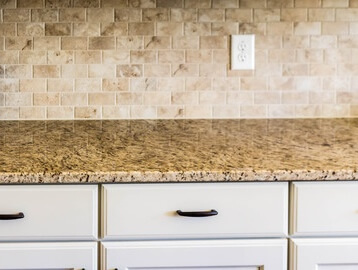 Granite is a hard stone and as a kitchen granite countertop it can take hot items, like pots and pans, and is very stain resistant to hot grease and oil when it is sealed. Kitchen granite countertops have a natural beauty that is capable of complementing any tone of wood or style of cabinets. Kitchen granite countertops increase your home’s value. The kitchen is where everyone comes when they are home and whenever you have visitors. If the kids are not sitting at the counter doing homework, talking on their phones or eating a snack, then your guests are in the kitchen with you, while you prepare a meal or brunch, talking about the soap operas. Whatever the reason, your kitchen is the gathering place. So, make it the best gathering place you can by letting us install new granite countertops for you. We’re industry leaders in granite and other stone solutions for your home. We don’t just supply granite for you. We fabricate it and expertly install it so that your Rochester MI kitchen will be vibrant and beautiful for many years to come. When you visit our showroom in Troy, you’ll be able to browse quality imported granite products from other countries and you’ll enjoy knowing that the best product is gracing your home’s interior. You can call us today at 248.307.0832 and schedule a free in home estimate and design consultation.